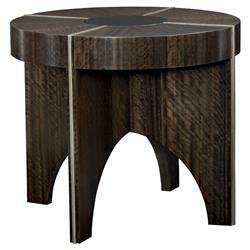 Looks don't have to be sacrificed for function and this sleek, modern end table proves it. Crafted from eucalyptus wood in a rich, aged bourbon finish, the round table commands attention with a striking, sculptural design centered around a base of wide, angled panels with bold arch cutouts. The tabletop is accented with an inset of bronze glass and strips of smoked bronze metal that cascade past the apron and down the legs for a welcome contrast in texture and material.